As we desire to seamlessly embed the electronics within our eTextiles projects, we often seek for small but powerful computation or small and energy efficient solutions. Lilypad to Teensey, there are many choices, but what do you choose? and why? When the project needs to connect with other computers and networks, the problem is even bigger. How do you connect wirelessly? Bluetooth? Xbee? WIFI? Let’s Geek out and experiment with small solutions, battery and wireless modules. let’s build a sensor-actor network and figure out what to do with it. connect eTextiles with a network. what for and why? IoT(extile) geek-out. 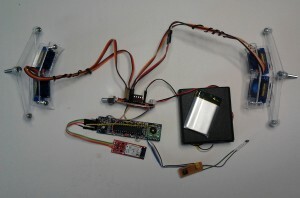 how do you power your projects when it is small and wireless? Lipo battery? coin cell? 9V? or any other? what are the pro and cons of these battery choices? Is there an ultimate choice? I’m really interested in this group. I just participated in a hack this past weekend and used Bluetooth LE for the first time. Was really impressed with how much better it was to use than my Bluetooth experiences of a few years ago. I fear this topic may not have enough interest to sustain it into a full group, so I’m going to register my interest with the Industrialization group as well. … moved to industrialisation group. I am interested this focus group. I am working into a project trying to connect several devices, so it will be quite useful to experiment on this. It will be interesting also to combine it with the printing and sustainable topics. I have been playing around with Xbee and Bluetooth to find a good solution for performance costumes, but never found the ultimate solution. It will be really nice to geek out and experiment on ultimate setup. I will be particularly interested in trying out WIFI module ESP8266. we are merging this group into “Tools for Practitioners”. Actually we separate this group again. There will be a “Go Small Go Wireless” group at the summer camp. Yuhu! So I’m a bit confused whether this one still exists, but anyways I am in for this topic!